I know fall is still two months away but the weather around here has been "fall like" the past couple of days. I figure why not make some soup? Yes, I'm fully aware that it's the end of July! 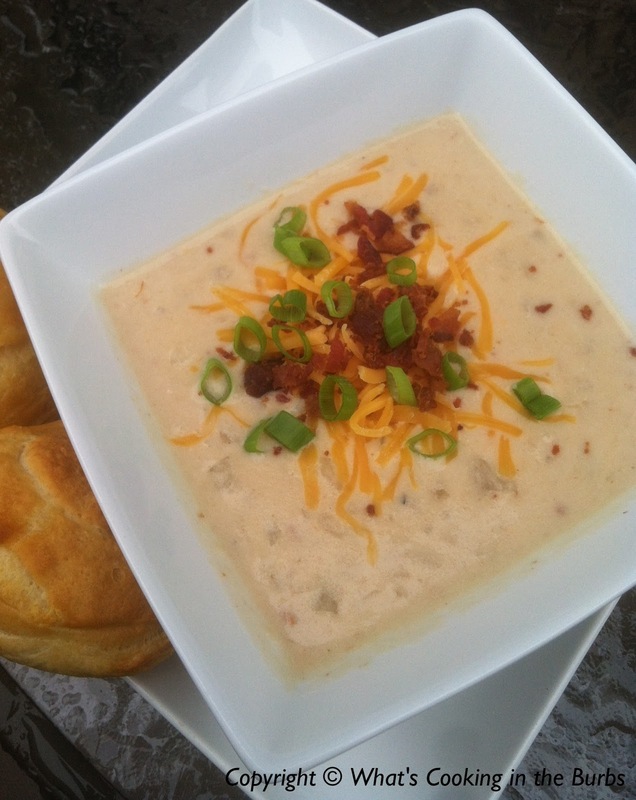 I've seen lots of recipes floating around for cream cheese potato soup. I've never made a potato soup that uses cream cheese so I had to try it. I made mine in my crock pot and oh my goodness, was it good! Add potatoes, chicken broth, cayenne pepper, cajun seasoning, garlic powder, and chopped onion to the crock pot. Stir. Cover and cook on low for 6-8 hours. During last hour of cooking time, stir in your cream cheese and bacon. Ladle soup into bowls and top with shredded cheddar, green onion, and additional bacon if desired. Enjoy! This looks and sounds great. I imagine it tasting like a spicy perogy. I'm surprised it's so low cal! It sounds so decadent. I am definitely making this come fall. I'd be a rebel and make it now, but I'm in Florida and it would probably make me sweat haha. I'm making this for tonight. It's already sitting in the crockpot! Thanks for this awesome recipe!